Drupal blocks are the basic building elements of any Drupal page. Blocks are placed in block regions and they serve different purposes from showing a list of elements even to show a picture or a video. Having a look at a block’s configuration page (Site Building >> Blocks >> List) and clicking configure aside one of the block descriptions there are various ways to control the visibility of a particular Drupal block.Some are let users control what they see, to show only to block to only specific roles. But what if I want to show a block in one node type (or content type), then the need to choose the third option “Show if the following PHP code returns TRUE (PHP-mode, experts only).” arises. It does not need expert knowledge. After selecting the third option on “Page specific visibility settings”, the logic is quite simple if TRUE is returned the block is shown if FALSE is returned the block is hidded from display. 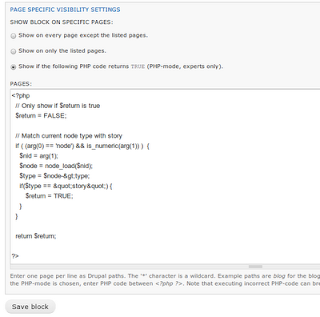 Lets say I want to see a the block only on story content type, then I can do it by pasting the code below on the PHP code option in page specific visibility settings. You can further enhance it with multiple node types with use of the in_array() php function to show multiple node types. Or tweak it to fit your custom needs. og_get_group_context(): Used for things like setting current theme and breadcrumbs. - Check og module for more information or see it here. og_is_group_member(): Check a user’s membership in a group. More here. The above code could have been better :). 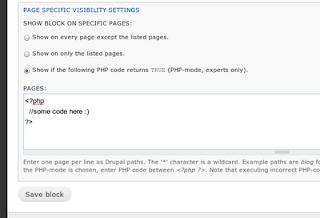 Above code should also be put in the “Page specific visibility” of the block configuration settings page. If the module will have setting to choose the node types and other things it would be great ;). 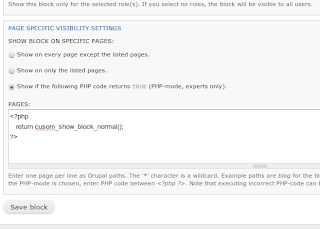 Block visibility with PHP is very flexible and customizable like other parts of Drupal. With block visibility for specific pages with PHP the need to show a block for specified condition will be easier. Happy coding.